Members of the union representing UC workers, the American Federation for State, County, and Municipal Employees Local 3299, overwhelmingly voted to authorize a university-wide strike on April 18, as part of AFSCME’s ongoing dispute with the UC administration over wage negotiations and widening inequality. The union is also calling on U.S. Representative and civil rights icon John Lewis, who will be delivering the commencement address at UC San Diego’s graduation ceremony in June, and other UC commencement speakers to boycott their engagements with the university as a display of support for AFSCME. Among the union’s demands are a six percent wage increase across the board each year, prioritizing pension stability and setting the retirement age at 60 years old, no increases to healthcare costs, and no collaboration by the administration with Immigration, Customs, and Enforcement. 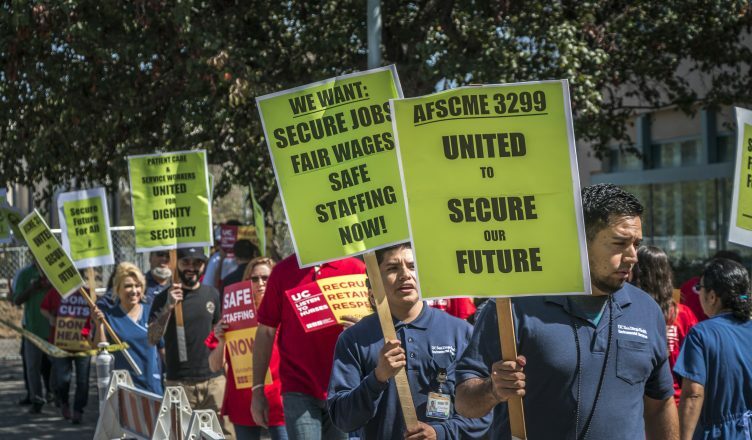 According to AFSCME Communications Director John de los Angeles, while it has been authorized, the strike will only actually take place if absolutely necessary. De los Angeles also explained that a report released by AFSCME found widening income, race, and gender inequality among UC workers. The report, which was published earlier this month, indicates that between 2005 and 2015, the top ten percent of UC wage earners saw their share of the total payroll cost grow from 22 percent to 31 percent while the share of the bottom 50 percent of wage earners decreased from 24 percent to 22 percent. “Whites and Asian/Pacific Islander workers are more often hired into higher-paying titles, while Blacks, Latinos, and Latinas are more often hired into lower-paying jobs,” AFSCME stated, concluding that racial and gender hierarchies have formed among employees. The UC administration has also not provided any adequate proposals on recruitment, retention, and training to resolve these inequalities, de los Angeles said. While student employees are not included in AFSCME, student workers are legally allowed to join the strike and picket lines in support of AFSCME’s actions, which de los Angeles noted is important considering that many union members do not have the time to attend their demonstrations. UCSD A.S. Senate voted to approve a pledge in support of the strike at their Wednesday night meeting and committed to sending a letter to UC President Janet Napolitano as well as attending and honoring AFSCME’s events..
No date has been set for the strike, but the university will be provided with a ten-day notice if a strike is confirmed. Rep. Lewis has yet to respond to AFSCME’s call to boycott. This is just so unprofessional to New Grads. It is nothing to do with the graduation speech for students. Now their parents and friends are just like ..